Your path to improving patient experience starts here. Developed by a community of over 400 patient experience leaders, Patient Experience (PX) Body of Knowledge courses are a comprehensive learning framework, providing a clear path to delivering superior patient experience performance. Earn a Certificate in Patient Experience Leadership by completing all 15 courses and a Certificate in Patient Advocacy by completing 7 specific courses plus completion of the course, Introduction to Patient Advocacy and the Management of Complaints and Grievances. Facilitated virtual classroom offering the ability to discuss practical application. For each course, classes will be offered on multiple dates and times. Class size is limited and a minimum number of participants is required to hold each course. > View the Calendar. *On-demand learning sessions can be accessed for 30 days following completion of all course or program requirements. Upon request, individuals registered for the Certified Patient Experience Professional (CPXP) exam may receive extended access to completed courses to assist in exam preparation. *Installment plans and volume pricing available. **Both the Certificate in Patient Experience Leadership and Patient Advocacy. 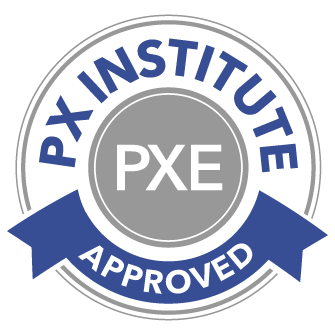 Courses are approved for Patient Experience Continuing Education Credits (PXEs). Depending on the course, each on-demand session will take an average of 120 minutes. The 15 on-demand learning sessions provide a comprehensive content overview. Click on each course title below to learn more. Building trusting and effective relationships/partnerships is critical in providing excellence in patient care, clinical outcomes and high quality patient experiences. Learn how to establish and sustain effective clinical relationships and to ensure engagement with your patient experience plans. Recognize how the organizational and clinical value systems form the patient experience in the hospital/clinical setting. Describe how the current core culture of your organization impacts the overall patient experience. Identify strategies to establish and sustain effective clinical (physician, nurse leaders and staff, and practitioner) relationships and ensure engagement with patient experience plans. Identify the roadblocks and opportunities in establishing central communication by honest assessments of your organization’s cultures. For coaching to be successful, an organization must adopt a Coaching Culture and embed coaching into the way extraordinary care and service is assured on a daily basis. In this course you will learn how to build a coaching culture with the help of the Patient Experience Leader, as he or she influences others up, across and down the organization, assists people in expanding their visions, builds their confidence and unlocks their potential toward achieving their performance goals. There are an unlimited number of factors that impact interpersonal as well as organization communication effectiveness. Leveraging key internal and external communication strategies is essential for ensuring the optimal patient experience. In this course you will learn proven patient and family communication methods, components and processes necessary to develop and implement a strategic communication plan to support the patient experience, and recommended educational efforts to reinforce the desired service behaviors. Cultural sensitivity begins with a recognition that there are differences between cultures. These differences are reflected in the ways that different groups communicate and relate to one another and to Healthcare Professionals. In this course you will learn strategies and tools to support patient-centered care by identifying and addressing the differences in patients’ values, preferences and expressed needs. Understand the current demographics of the US population. An effective and high performing healthcare team is an essential key to the success of any organization. Attracting and engaging customer-focused employees who are passionate about providing the best and most compassionate care to the patient is a significant ingredient to ensuring a patient experience culture. In this course you will learn the key characteristics and benefits of an engaged workforce, how to hire for service attributes, and implementation techniques to foster ongoing employee engagement. Gathering experiences from patients, families and staff through various mechanisms such as observations, interviews and identifying touch points is having a positive effect on designing environments that better meet and exceed patient’s needs. In this course you will learn an approach to systematically understand how to design, manage and deliver services and care to patients/families for an improved patient experience. In this Healthcare Leadership and Management course, you will deepen your appreciation for the role of management and leadership on the patient experience journey. You will learn tools to partner more effectively with senior leadership to change the culture to advance the patient experience. What is the history of patient experience and how did healthcare get where it is today? In this course you will travel back in time to explore the past, learning about the many influences that have led to the current patient experience movement that exists today. The hospitality industry offers healthcare a holistic view of the guest experience. Learn how touch points, or the series of interactions and encounters in your organization, can create a positive patient experience. Being data-driven is essential for the patient experience professional. In this course you will learn how to understand, interpret and analyze data in ways that are both meaningful and purposeful to your organization. In order to improve the patient experience, significant organizational changes may be necessary. Formulating a strong implementation plan will improve the likelihood of success. In this course you will learn methods to assess organizational change readiness, create an effective improvement plan, and identify the leadership roles and responsibilities necessary to implement the plan. Engaging patients and families as partners in their healthcare is a national priority and top of mind for healthcare organizations is exploring ways to ensure an approach that is patient and family centered. In this course you will learn the core concepts of patient family centeredness, explore and contrast three different PFCC models and create a plan that supports your organization’s efforts to being a PFCC organization. Policy, regulations and ongoing healthcare reform are a contributor to transformational change in the healthcare industry. In this course you will explore and better understand the policy and regulatory issues that influence healthcare and the impact on your patient experience efforts. To understand the historical context for the emergence of the health policy and regulatory focus on patient experience measurement, reporting, and improvement. Even in the best care settings things can go wrong. Service recovery is the sincere effort made when patient and family members’ expectations fall short. In this course you will learn the benefits of having a dedicated service recovery culture, strategies and tools to manage patient concerns including proactive strategies to understand and increase the likelihood of exceeding patient and family expectations.